Bahasa Inggris Materi bergenre text akan membuat kalian semua menjadi malas dan ogah ogahan belajar karena harus banyak membaca. Padahal nantinya dalam UN bisa dipastikan hampir selalu dan sering keluar text yang berjumlah lebih dari 30 soal. Masih ogah belajar text? Berikut ini adalah text yang bergenre narrative. Meskipun terkadang membingungkan siswa jika teks ini di sandingkan dengan teks recount, tetapi tetapp memiliki perbedaan yang pasti, artikel kali ini membahas tentang teks narrative dulu. 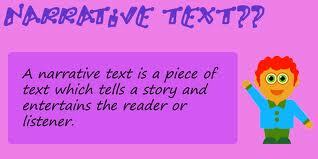 Text narrative adalah teks yang isinya cerita fiksi/dongeng/cerita rakyat, cerita rakyat, cerita binatang / fabel dll, pokoknya semua hal tentang cerita ya narrative namanya. Gampangnya sih kalo penulis menjelaskan teks ini akan saya tanya tau ga fiksi itu apa??? nyata ga sih??? trus pernah liat ga??? Nah jika jawaban dalam dunia nyata ternyata tidak ada, maka jawabannya adalah narrative. Once there was a king of evil from the kingdom of Iman Imantaka whose name is Niwata Kawaca. He was a powerful and cruel king who had conquered many kingdoms. The invincible king then had another ambition. He wanted to marry a beautiful angel from the heaven of god whose name is Dewi Supraba. He came to god Indra to propose for the beautiful angel. But the god refused. He thought that the king was not a good husband for the angel. The king was so angry that he decided to attack Kingdom of god Indra. The army of Niwata Kawaca proved to be very strong. The army of god was easily defeated. Luckily the god managed to close the gate. Then the god's palace was besieged by the army of Niwata Kawaca. Then the god Indra decided to ask for help of human being. His choice fell into Arjuna, the third son of Pandu. At that time Arjuna was meditating in Mount Indrakila. He was meditating there to pray and to search for spiritual power that he needed to face the great war of Barata yudha (war of the Barata family). God Indra wanted to test his spiritual power to know whether he was fit for the battle with Niwata Kawaca. Indra sent seven beautiful angels to tease Arjuna. Two of the most beautiful ones were Supraba and Tilottama. They used their beauty to tease him but Arjuna was proved to be a true hero. He could resist their temptation. Indra was sure that Arjuna was the right person to overcome the problem. Meanwhile King Niwata Kawaca realized that there was a hero who could be a threat to his power. That's why he decided to eliminate the potential threat. He sent a monster that could change himself into a wild boar. His name was Momong Murka. Momong Murka came to the village where Arjuna was doing ascetics. As he got there soon he changed himself into a giant wild bore and destroyed the village. Arjuna did not let him do further damage so he fought back. The wild boar was so strong that he was forced to use his new weapon. He attacked the wild boar with an arrow and it was killed instantly. But as he came closer to take a look at it he was very surprised to see another hero stood by it arrogantly. 'Excuse me, did you shoot it? Look this is my arrow', the hero said. The quarrel became so tense that they were both became very angry. The two heroes fought fiercely but finally the other hero could beat Arjuna. As he sat in the ground suddenly the hero changed into god Syiwa. Arjuna was shocked so he saluted the god immediately. Not long after that Syiwa disappeared like smoke. Arjuna was then a very powerful hero. Just as he was about to go home to Indraprasta, an emissary from Indra came to see him. 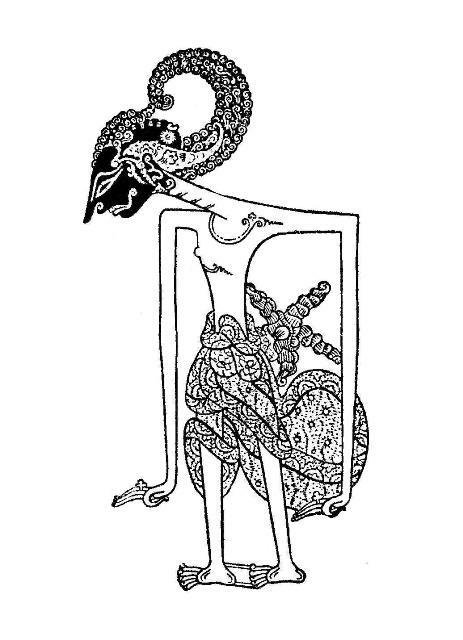 He asked Arjuna to help Indra fight King Niwata Kawaca. Arjuna agreed to help because he realized that it was his duty as a hero to protect anyone who needs his help. In the heaven of god Indra, a discussion was held to overcome the threat of King Niwata Kawaca. Indra told Arjuna that Niwata Kawaca was unbeatable. He was very strong and he could resist any kinds of weapon, even the most lethal ones. His victims were countless. So they had to find out a strategy. Arjuna decided to find out the secret of his weakness. He ordered Supraba, the most beautiful angel, to surrender to King Niwata Kawaca. But it is only a trick to search for his weakness. Arjuna would protect her from a distant. He had a spiritual mystical power that could make him invisible. Indra and Supraba agreed to the plan. So one day Supraba came to kingdom of Iman Imantaka to see King Niwata Kawaca. Arjuna who was invisible kept guarding her. The King was very happy to welcome her. 'O, my dear one. I have been waiting for this happy moment. But why you leave the heaven of Indra? King Niwata Kawaca had fallen in love to Supraba for a long time. He did not realize that it was only a trick. Supraba kept praising him so Niwata Kawaca was flattered and he lost control of his emotion. Then Supraba asked about his power. Arjuna who stood by Supraba heard that. But he was invisible. Soon he went out of the palace and destroyed the front gate of the palace. When the soldiers were busy hunting for him Arjuna went back to the palace and saved Supraba. They fled to the heaven of Indra. King Niwata Kawaca was very angry to hear that Supraba had escaped. He realized that god Indra and Arjuna were behind the event. So he immediately prepared his army to invade the heaven of Indra. He had a strong army of monsters. Then Arjuna came to fight him. Niwata Kawaca who realized that his secret had revealed fought very carefully although he was very angry. He never opened his mouth. Consequently it was very difficult for Arjuna to beat him. Then Arjuna tried a different strategy. When Niwata Kawaca hit him, he fell to the ground and cried. Niwata Kawaca was very satisfied when he saw Arjuna fell and then sat helplessly on the ground. He was sure that he won the fight. Niwata Kawaca was very satisfied. He laughed out loud. He was just about to finish his words when an arrow suddenly broke into his mouth. The mighty Pasopati arrow from Arjuna went through his mouth and hit his tongue. Niwata Kawaca was killed instantly. His army was shocked and soon they were demoralized. They had no choice but to surrender to the army of god. The god Indra was very satisfied with Arjuna's contribution. So he gave him a great reward. Arjuna married the most beautiful angels of heaven including Supraba and Tilottama. After that he stayed in heaven for seven months. But then he had to leave heaven. Finally he left them and returned to Indraprastha to serve for his country and his family.